Before we jump into the differences between Bugambilia® Tiles and Bugambilia® Fit Perfect™ systems, let's define exactly what it is we're talking about. A cold well is a piece of restaurant refrigeration equipment designed to house food pans, aka crocks. The crocks are either nestled into ice or supported by configuration systems (much more on these later) that hold the pans in place. In this case, we're only addressing cold wells using configuration systems because if you're using ice to keep your crocks in place, the ice is essentially your configuration system. Cold wells can be used in the back- or front-of-house. Common back-of-house applications can be anything from an assembly line for sandwich toppings to salad and dessert stations. Front-of-house applications are similar, but are almost always self-serve style. We're going to focus on front-of-house applications here because nobody puts Bugambilia® in a corner. *wink! * But seriously, both systems are beautiful and will absolutely dazzle your guests. 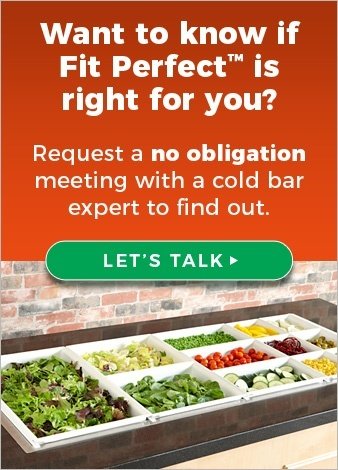 Why Do Foodservice Operators Love Both Bugambilia® Tile and Fit Perfect™ Systems for Their Cold Bars? Historically, stainless steel pans have been the go-to for cold wells. Stainless has plenty of good foodservice applications, but often creates a utilitarian look, lacking much presentation value. Bugambilia® is a line of unique, resin-coated aluminum serveware. Bugambilia® Tile system consists of tiles and food pans while Bugambilia® Fit Perfect™ system consists of food pans and spacer and gap bars. They're both wonderful systems that will significantly upgrade any cold bar presentation. Pictured: a custom salad bar setup at a major restaurant chain using a Bugambilia® Classic tile system. Bugambilia® Tiles are currently stocked in Bugambilia® Classic finish, which offers a playful, rough texture. Fit Perfect™ is stocked in the new Bugambilia® Mod finish, which is sleek and smooth. 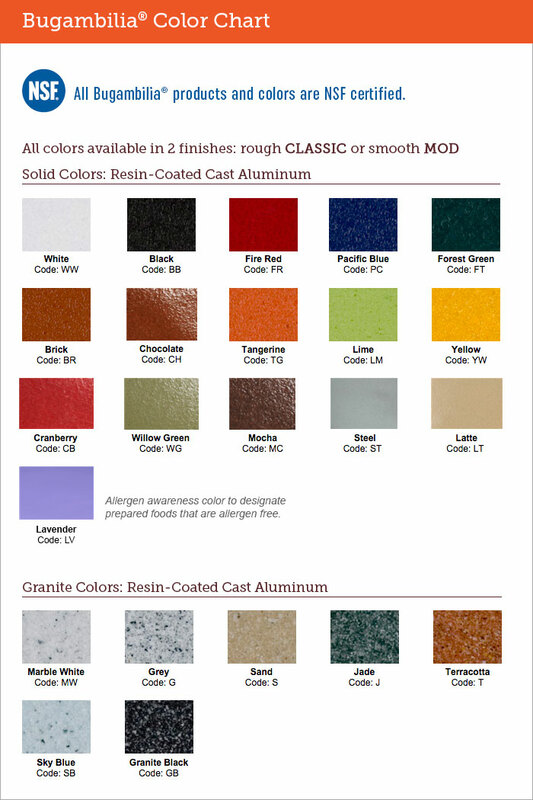 Both collections are available in 23 colors and both finishes, which are all NSF-certified options. Regardless of the style you choose, both Bugambilia® lines will upgrade your cold bar aesthetics beyond anything a fully stainless steel setup could offer. The look is elegant, sharp, and clean, and you may even be able to charge a little more for your cold well service because of the high-end positioning. If you prefer an upgraded, textbook look on your cold bar, Bugambilia® Tile is a great choice. However, if you desire a smooth, sleek look that's a little more modern, Fit Perfect™ is the way to go. All Bugambilia® serveware is NSF-certified. NSF certification is a big deal as it ensures the safety, design, and construction for foodservice materials. The rounded corners featured in both product lines also help secure certification because NSF doesn't allow 90° angles where food can get stuck. Some similar products offered by other brands have 90° angles, making it difficult to achieve official NSF certification. Both Bugambilia® Tiles and Fit Perfect™ are primarily used for cold applications. The resin-coated aluminum conducts temperature better than stainless steel, getting colder faster and holding temp longer. One difference, however, is that Fit Perfect™ crocks are stackable - about 4-6 crocks tall - and Bugambilia® Tile pans are not. Stainless steel pans also stack, but often stick together so much that you may have to bang them on the counter or use a spatula to separate them. These two systems have a lot in common, and as you can see, offer features that stainless steel and other cold bar setups can't. However, because of their design, Bugambilia® Tile and Bugambilia® Fit Perfect™ hold crocks in fundamentally different ways, using tiles and bars respectively. That difference will impact your operation in various ways. Let's take a closer look, shall we? When you put food pans in a cold well, you'll need something to hold them in place. You don't want your crocks sliding around, getting knocked over, or falling through. You want them firmly held in place and looking amazing for your guests. Both Bugambilia® Fit Perfect™ and Bugambilia® Tile systems do this well, but in different ways. Pictured: Bugambilia® Classic tile system setup using standard-sized configurations. Tile systems are essentially large, solid pieces of resin-coated aluminum with spaces cut out in the middle to house food pans. Because the spaces are cut to accommodate specific crocks, you can expect them to fit in firmly and not move around. To set up cold bar service using a tile system, all you have to do is put down your tiles, fill your pre-chilled crocks in the back-of-house, then place them in their designated spaces on the cold well. It's a pretty quick process. Most newer cold wells are made in standard sizes. G.E.T. keeps standard-sized tiles in stock in 24 different configurations. For operators, this means you have plenty of ways to set up your cold bar without being locked into a single configuration. Let's say your cold well can accommodate 5 standard-sized tiles. Ordering 7 or 10 tiles with different configuration setups builds flexibility into your cold well design. If you serve breakfast, lunch, and dinner, and have different needs from your cold well during those day parts, you can plan for that by ordering different tiles and changing them between shifts. It's not uncommon to create custom sizes and shapes of tiles to fit older cold wells or ones that feature custom designs often found in casinos, large university dining halls and/or corporate campus dining. As long as G.E.T. has the proper measurements, we can create custom tiles to fit practically any shape or size cold well. 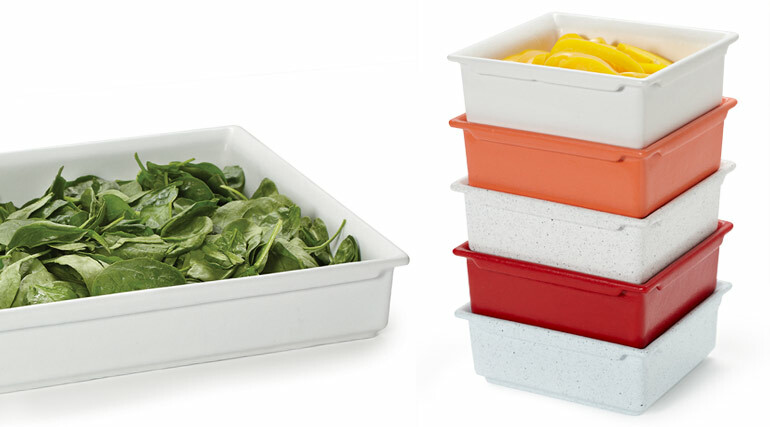 To be clear, you'd still be able to use standard Bugambilia® Tile food pans. The actual tiles are the only pieces you'd have to customize for an off size or shape cold well. Tiles are suited for, and can be customized to fit any cold bars with curves in their design, say a semi-circle or a mock ocean wave, which is something that Fit Perfect™ doesn't do well. Here at G.E.T., we provide clear instructions for how to measure off-sized cold bars, and have dedicated professionals who are happy to jump in if you need any help. If you're interested in learning more, call us at (800) 727-4500, email us at info@get-melamine.com, or connect with us on our Contact Us page. Fit Perfect™ shares many qualities with the tile system but is fundamentally different in a few areas that may create efficiencies the tile system can't offer. Or maybe not. It just depends on your operational needs. Let's dive in and you can answer that question for yourself. Bugambilia® Fit Perfect™ features standard sized food pans, but unlike the Bugambilia® Tile system, does not feature off shapes or sizes. This is because the design of the system is basically a movable grid - hence the name Fit Perfect™ - that wouldn't be able to accommodate them. Pictured: Bugambilia® Fit Perfect™ easy setup cold bar system. Minimal measuring is required with Fit Perfect™ because of the natural nimbleness of the system. We'll need length and width, but under normal circumstances, that's about it. Patent-pending Fit Perfect™ crocks feature a lip around the top edge that fits over a raised part of a spacer bar, which locks the crocks into place. The spacer bars rest on top of cold wells, which means they don't need to rely on a notch to keep them in place. In turn, that allows you to position and reposition your bars however you like, whenever you like. 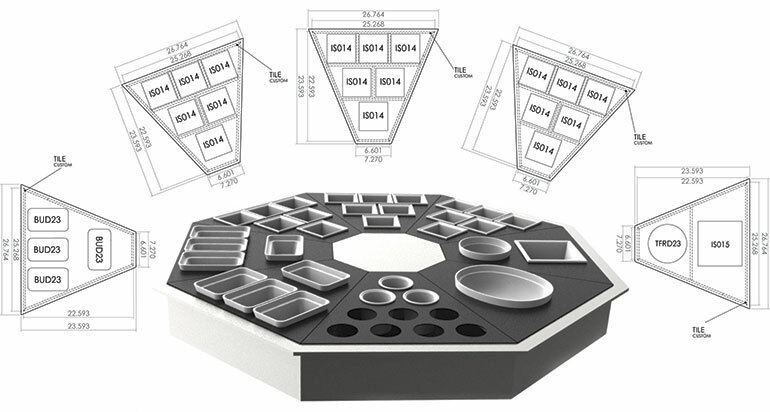 As opposed to a tile system that delivers pre-set configurations, Fit Perfect™ spacer bars are designed to let foodservice operators create the configuration that works best for them on any particular day. Spacer bars can be as far apart or as close together as desired, as long as there's enough room between them to fit the food pans, of course. The Bugambilia® Fit Perfect™ system offers built-in flexibility. Unlike the Bugambilia® Tile system, where you may need to keep a handful of tiles in-house to reconfigure your setup, one Fit Perfect™ system is all you need to create whatever setup you require. Bugambilia® Fit Perfect™ has a gap bar feature because there can be slight variations in sizes of standard cold wells. If you wind up with a little extra space that your food pans aren't covering, the gap bar will fill that area so you don't lose cold air. Gap bars are stocked in 5 sizes, ranging from 1"-3" in half-inch increments. Custom gap bars are also available, they just take a little longer to fulfill. Pictured: the Bugambilia® Fit Perfect™ easy setup process with proprietary spacer bars. Why Would You Need to Reconfigure Your Setup on the Fly? Remember when eggs and limes were worth their weight in gold a couple years ago? Tomato recalls? Cantaloupe shortages? The commodities market fluctuates all the time, and Fit Perfect™ lets you respond by simply adjusting your existing setup. You don't have to worry about ordering new tiles if you need to temporarily change your cold well configuration. You may also want to try different configurations to see if throughput can be improved, or to highlight lower food-cost items. Operators have plenty of reasons to adjust their cold bar configurations. It can be done with a tile system if there are extra tiles on-hand, but Fit Perfect™ is always ready to be reconfigured. When it's time to swap out a crock or clean up for the evening, Bugambilia® Fit Perfect™ has an easy-lift edge. The aforementioned lip that locks the food pan onto the spacer bars stops at each corner, giving you plenty of room to easily remove pans. Bugambilia® Tile system does a good job of this as well because the rough coating helps with grip, and the top of the crocks usually lay above the tiles. But Fit Perfect™ is designed to have a seamless look - the edges of the food pans sit flush with each other - so if that easy-lift corner wasn't there, it would be difficult to remove the pans. We've got a team of folks who are happy to help you with any questions you may have. You can reach us at (800) 727-4500, via email at info@get-melamine.com, or on our Contact Us page. Learn a little more about G.E.T. 's brand-new Bugambilia® Fit Perfect™ in "Review of Bugambilia® Fit Perfect™: The Easy Setup Cold Bar Solution for Foodservice."